Okay, I admit it. I did. I put pumpkin puree into pizza dough. And I did it when we had poor, unsuspecting friends coming over. And the recipe didn’t share how long to cook it in the oven. Or what temperature. But it worked out. Really! Our friends loved the pizza. The two year olds (when they weren’t being distracted by the fact that they were about to go trick or treating) loved it. And my husband and I loved it as well. So how this all started, was me thinking that I should make a pumpkin shaped pizza, like I do every Halloween. Then I got to thinking that it was be even cooler if, somewhere on the internet, there existed a recipe for pumpkin pizza dough. Pumpkin pumpkin pizza! Awesomeness! 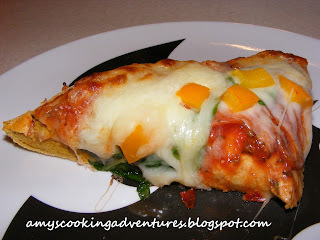 The search was actually a long one, as most pumpkin pizza doughs are sweet, more suited for dessert pizza, than savory. But I stumbled upon a fun new blog (new to me that is), The Cooking Photographer, and there is was! The Cooking Photographer always grills her pizza, thus the reason for the lack of oven baking directions. I have grilled pizza in the past (and like it), but wanted to take more time decorating the pizza than one usually has when grilling a pizza. So, I just used the baking directions from another one of my pizza recipes, and a very tasty pizza was baked. There is just the lightest taste of pumpkin complemented by a lovely orange hue that is perfect for a pumpkin pumpkin pizza. I used this dough at Halloween, but it is delicious and would be appropriate any time of year. Plus veggies, in pizza, that the kids can’t pick off? Awesome. Mix together water, yeast, and honey. Cover with a damp cloth. Set aside for 5 minutes. 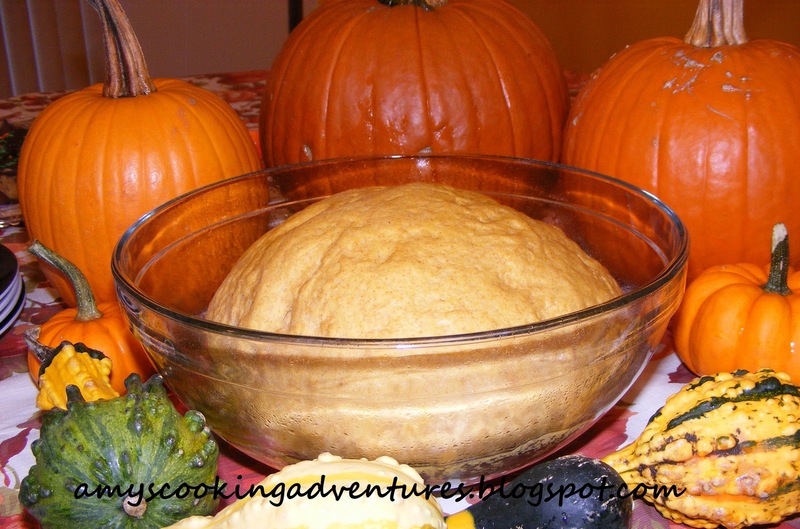 Put yeast mixture, half the flour, pumpkin, olive oil, salt, onion powder, and garlic powder together in a bowl and mix. Turn out onto a floured surface and begin kneading remaining flour in until you have a smooth ball of dough. Coat a large bowl with olive oil, turn dough to coat. Cover with a damp cloth and put in a warm, draft free place to rise for about 1 hour or until doubled in size. 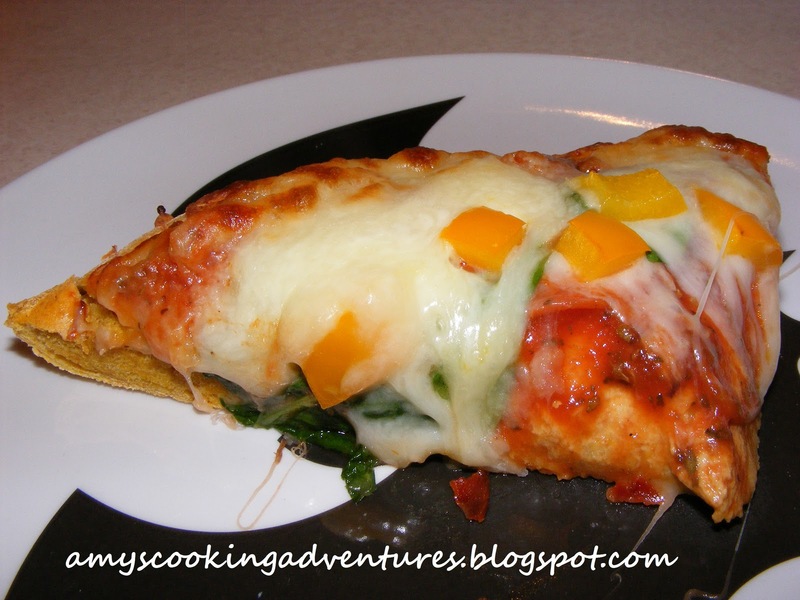 Cook for 10-15 minutes or until cheese in melted and crust is golden brown. *For my pizza I did a layer of sauce, followed by turkey pepperoni, spinach, and mozzarella cheese. 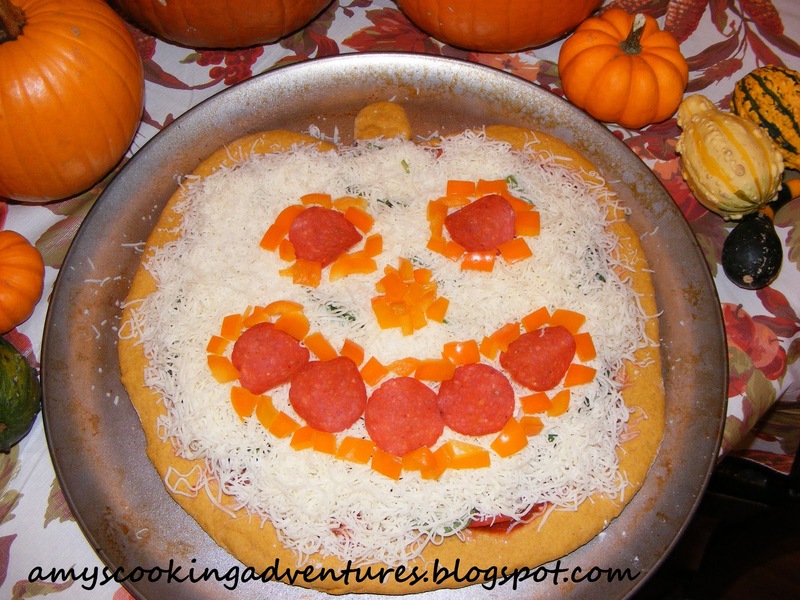 I added more pepperoni and orange peppers on top to make a pumpkin face.